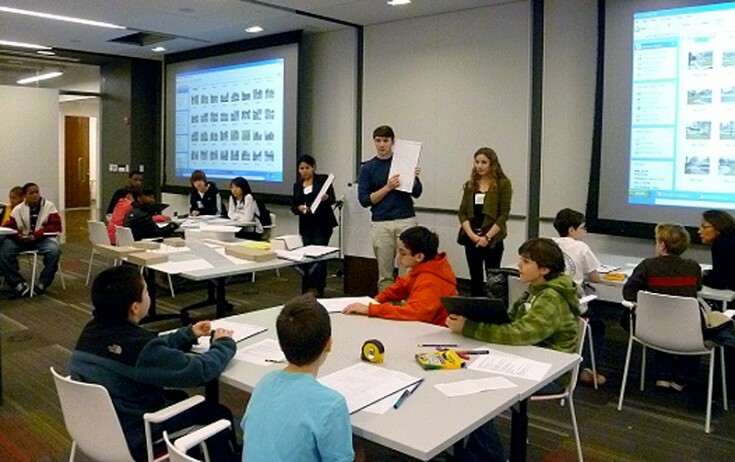 The District Architecture Center has been hosting a series of classes geared towards future generations of architects. Last weekend we helped this new generation by teaching the “Site Concepts and Design” workshop. Led by Oksana Ramos, Alex Barker, and Emily Margulies of Cunningham | Quill Architects, the class was geared towards learning the fundamentals of schematic design. Oksana, Alex, and Emily teaching the “Site Concepts & Design” class for the Young Architects series. Twenty-six students participated in this unique learning event, where they explored an actual site for their proposed restaurant. Using the Naval Heritage Center site in Penn Quarter, students were able to measure and document the location of their restaurant. They oriented the site along the cardinal directions, took measurements, and noted important features. After measuring, the students returned to the Center to create a design concept with programming to accommodate indoor and outdoor seating, the kitchen, restrooms, and the entry/reception area. 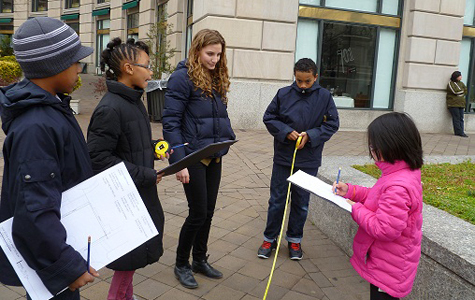 Emily helping a group of children measure and document the Penn Quarter Site. Oksana, Emily, and Alex helped the young participants build models of their restaurants, encouraging their creativity along the way. When the children finished their models, they had the opportunity to place them in a larger model of the site. Two brothers in the class show off their completed restaurant models. 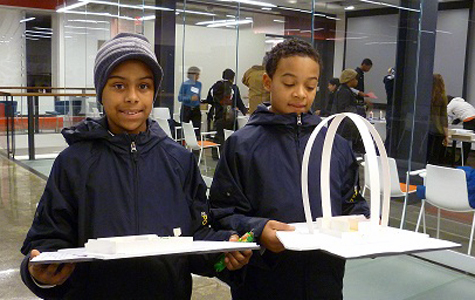 Students were able to learn about the relationship between a building’s surroundings and interior spaces, ultimately learning how the different parts of a building come together.